Holly Andersen, project manager for the Planning Office, was the staff speaker at Convocation 2018. She shared her career over the course of nearly a decade spent at Bennington, reflected upon her experiences as a first-generation college student, and encouraged students to take advantage of the family found on campus. 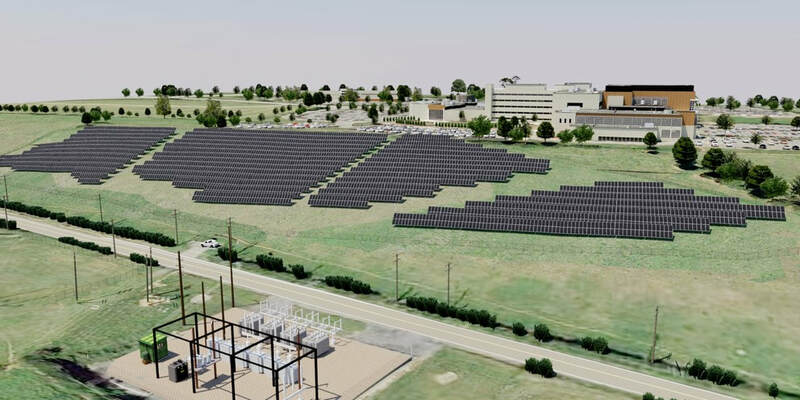 UNIVERSITY PARK, Pa. — A new project will provide 2,500 megawatt-hours of clean, reliable and affordable solar-generated energy annually to the University as part of its diversified energy portfolio. The Penn State Office of Physical Plant and Alternative Energy Development Group (AEDG) announced Sept. 19 the development of a 2 megawatt Advanced Utility-Scale Solar photovoltaic system. The solar project will provide 1 percent of University Park’s campus electricity needs. Included in the project will be an educational kiosk supporting academic instruction and research, sharing real-time performance data of the array. In addition, the array also will offer Penn State opportunities to test future technological developments in the field. Establishing a significant and visible onsite solar photovoltaic project site. Balancing economics, social benefits and environmental impact of solar energy projects. Advancing research and grant development opportunities. Creating a large-scale, micro-grid, living lab opportunity. The array was developed by AEDG, a Pennsylvania-based renewable energy developer, and will be financed, owned, maintained and operated by AEDG and MVE Capital, Inc., an affiliate of the MVE Group, Inc., in Ephrata, Pennsylvania. The University has entered into a 25-year, solar-power purchase agreement to purchase 100 percent of the electricity and PA Alternative Energy Credits generated by the solar system for the term of the agreement. Penn State, the project sponsor and beneficiary of the clean/renewable power provided by the solar system; and educational participation in the feasibility, design, implementation and optimization of the system. Alternative Energy Development Group, a Berwyn, Pennsylvania, firm, is the project’s lead developer and co-financial owner and operator. MVE Capital, Inc. is the project’s co-financial owner and operator, along with Meadow Valley Electric, Inc., the project's general construction and electrical contracting provider. West Penn Power as Penn State’s utility and solar interconnection counterparty. West Penn Power Sustainable Energy Fund as a lender to the project. This is not the first solar project the University has supported or sponsored. OPP, with the help of students and a $75,000 grant from the Sustainability Institute’s Reinvention Fund, installed a solar array outside its main facility to provide power to charge its 100 percent electric vehicles. The MorningStar Solar Home, located in the Sustainability Experience Center, was built in 2007 and is a 100 percent renewable energy powered home. It is used by teachers and faculty as an immersive learning destination. In addition, the Penn State Class of 2015’s gift was a solar panel array powering a bus stop near Beaver Stadium. 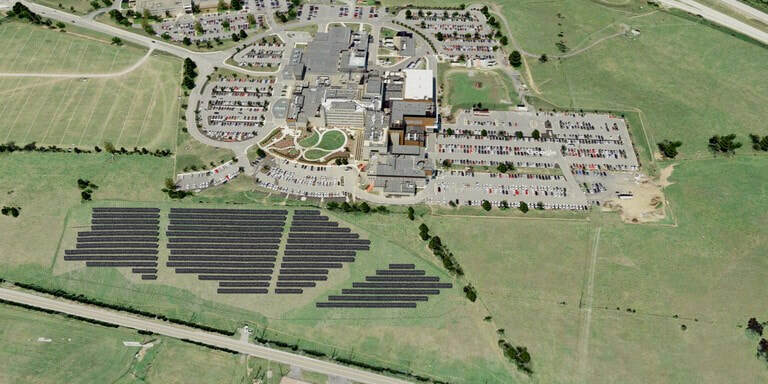 This rendering shows another view of the solar array and its location between Orchard Road and Mount Nittany Medical Center. ​(Philadelphia, Pennsylvania, September 14, 2018) Reinvestment Fund is pleased to announce the funding of Alternative Energy Development Group LLC, and affiliated companies SolarSense LLC, and their energy project company LLC’s, with a $5M revolving construction loan and line of credit. The revolving credit facility will finance AEDG’s construction of numerous, concurrent energy projects in the United States. The new credit facility will be used for a project beginning construction this month in Vermont, a 734 kW DC Solar PV system developed by AEDG and financed by its Fund, the Alternative Energy Infrastructure Projects Fund I, LP, and a tax-equity banking provider. The loan will also be used for a 2 MW single-axis tracker Solar PV project scheduled to begin construction in November 2018 for a publicly listed oil & natural gas client in California. AEDG is excited to announce that Bennington College (located in Bennington, Vermont) and SolarSense (headquartered in Berwyn, Pennsylvania) have entered into agreements for the College's participation in the Vermont Solar Group Net Metering program. Bennington College, a forward-thinking liberal arts college, is committed to the environment and sustainability, and SolarSense welcomes them into our family of valued Vermont customers. ​Through a genuinely distinctive education, Bennington cultivates a mindset for change, a capacity to break new ground, the conditions for progress. At Bennington, learning and making are inseparable. The faculty are committed not just intellectually, but also as leading practitioners in their field. Students develop ideas in the classroom, and then test those ideas where it counts—through hands-on work in the world. The result is a learning experience free of artificial barriers where students imagine, shape, and pursue their best work. The Alternative Energy Infrastructure Projects Fund I, LP (AEIP Fund I), invests in renewable and alternative energy Projects that are sited at, or developed for, Commercial & Industrial client sites in the US, all with long term customer revenue contracts. The portfolio consists of a mixture of commercially proven energy technologies including Solar PV, Natural gas distributed generation (turbines and fuel cells), and Battery Energy Storage Systems (BESS). The Fund’s objective is to own and manage a portfolio of energy projects that in aggregate deliver a long term, predictable, tax efficient cash flow stream to its Investors. The Fund is managed by Alternative Energy Development Group (AEDG), a developer, owner and operator of Solar PV, Natural Gas DG, and Battery Energy Storage Projects whose Principals have a combined 85 years of experience providing clean, reliable and cost effective renewable energy solutions to US commercial enterprises and public sector entities, with > 1 Billion kWh’s contracted in operational energy projects to date. SEAFORD, Del. – Allen Harim presented five students with the first-ever Allen Harim Legacy Scholarship, which provides a $2,500 financial award for college. The Allen Harim Legacy Scholarship was created last month when the company announced they would be using savings from a newly installed solar project to create the program. The 1.57 megawatt, multi-million dollar solar project features 4,992 solar panels in a six-acre field, and is projected to generate 2.3 million kWh of power each year, while reducing carbon dioxide emissions by 1,616 metric tons every year. “This is another exciting environmental project for our company here in Harbeson and we are grateful to all our partners for making it happen,” said Joe Moran, president and CEO of Allen Harim, during the company’s ribbon cutting on May 15. The energy produced by the solar panels will supply about 11 to 12 percent of the energy used at the Harbeson facility, he said. During the ribbon cutting ceremony, Chris Fraga, founder and CEO of Alternative Energy Development Group, presented a check for $10,000 through the company’s Watts for Wishes charitable giving program to establish the Allen Harim Legacy Scholarship fund. Allen Harim will provide a $10,000 matching gift, and set up an endowed fund through the Community Foundation of the Eastern Shore. Fantasy Hopkins, of Bridgeville, Delaware. Her mother Michelle Horne has worked at Allen Harim in the Sourcing department at corporate headquarters since 2008. Hopkins graduated from Sussex Technical High School in May and plans to attend the Univ. of Delaware and major in Exercise Science, with the hopes of one day going on to become a doctor. Bridgette Laughery, of Seaford, Delaware. Her mother Sheila Laughery has worked in the Credit Department at the company’s corporate headquarters since 2008. Laughery graduated from Sussex Tech in May of 2014 and earned an Associate’s Degree in Architectural Engineering Technology from Delaware Tech. She plans to pursue another Associate’s Degree in Construction Management this fall. Macey Mitchell, of Millsboro, Delaware. Her parents, Steve and Wendy Mitchell, own Clear Skies Farm in Millsboro and have grown chickens for Allen Harim since 2016. She is a graduate of Sussex Technical High School and plans to attend Bryn Athyn College, in Bryn Athyn, Pennsylvania, where she plans to become a Special Education teacher. Devin Phillips, of Salisbury, Maryland. His father, Andrew J. Phillips, owns Old Country Farm located on Allen’s Mill Road in Delmar, Delaware, and has been a contract poultry grower with Allen Harim since 2010. He graduated from Wicomico High School in June and plans to attend Salisbury Univ. in the fall to study business. Joshua Tucker, of Boonville, North Carolina. His father Charles Tucker has worked in the Breeder Department in Liberty, North Carolina, since 2010. He has been attending Surry Community College but plans to attend Appalachian State Univ. in the fall, where he hopes to study business and accounting, and be the first person in his family to obtain a Bachelor’s degree.